To properly prepare for trenching several considerations will be made. We will mark off the locations for the trench. Before breaking ground we will check local code for any guidelines and call “Call Before You Dig” at 1-800-474-6886. Call Before You Dig will get a local utility to come out and mark the utility lines on your property. We will determine the size of the trench required for the job. Trench widths can vary based on drainage needs, location and utility. We will determine the equipment needed to complete the job. The slope of the property will also be taken into consideration to ensure proper design from the width to the depth of the trench. If needed the trench will be lined with a permeable landscaping material, filled with appropriate size of gravel or the product to best suit the application. This fabric will allow water to pass through while keeping dirt and debris from clogging your drain, making it less effective. 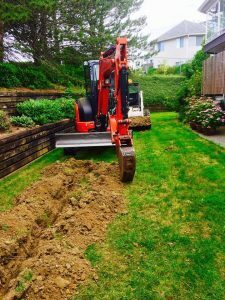 Ian McGillivray, the Owner/Operator of Rivercross Holdings Ltd. Bobcat & Excavation Services is fully insured and offers turnkey services from excavating to building. Since 1995 Rivercross Holdings Ltd. Bobcat and Excavation Services has been delivering top quality work from removing tree stumps to complicated contour changes in challenging landscapes. Comprised of mature and experienced professionals with the right business savvy and experience. Their goal is to get the job done correctly and provide a professional experience for the customer.